NOW AVAILABLE! 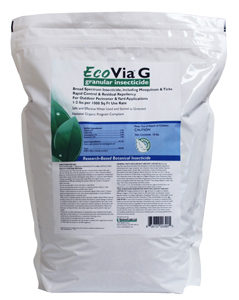 EcoVia G granular insecticide is a new research-based botanical insecticide that contains a higher level of botanical active ingredients compared to other 25(b) granules for lower use rates — while delivering quicker control and longer residual protection against a broad spectrum of crawling and flying insect pests. Available in a 10-lb. resealable bag, it can be used for outdoor perimeter and yard application, and is labeled for crawling insects, mosquitoes and ticks. EcoVia G is designated as exempt from the Federal Insecticide, Fungicide and Rodenticide Act (FIFRA) 25(b) and is in Rockwell Labs’ Green Zone product line.